This week, I'm reading a delightful series of emails from a friend who is making her way across England and Wales. 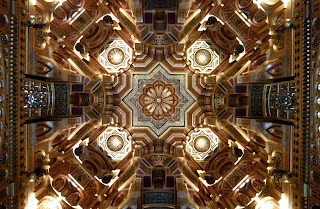 I urged her to visit Cardiff Castle, where brilliant colors abound and every surface is carved, painted, stenciled or gilded. That fantastical residence is the work of architect William Burgess, who reimagined the ancient castle for the Bute family. It illustrates the Victorians' romantic view of medieval times. 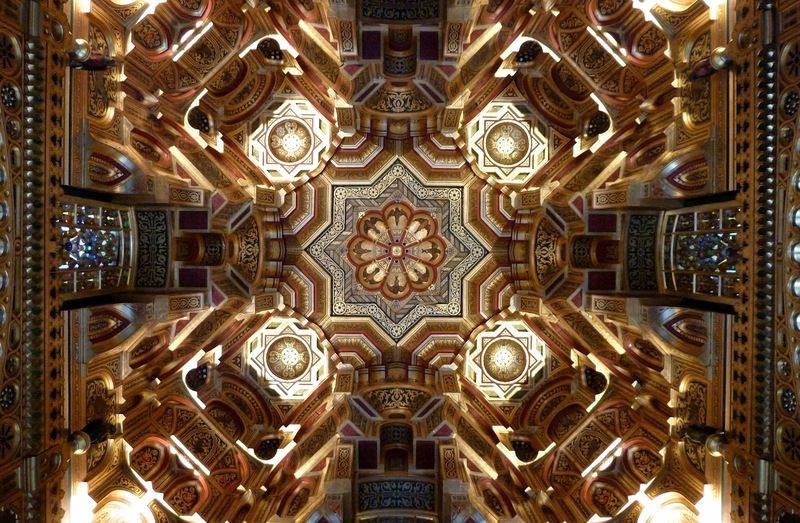 Here is the ceiling of the Arab Room, a kaleidoscopic masterpiece of gilded wood. A docent noticed that I was photographing the castle's many elaborate ceilings. She offered to take us into the most fabulous one of all, where I set my camera on the floor and captured this amazing sight. Thank you, kind lady.